How Do Sulfites In Wine Affect Me? According to Wikipedia, sulfites are compounds that contain the sulfite ion So3-2. The sulfite ion is the conjugate base of bisulfite. Although its acid (sulfurous acid) is elusive, its salts are widely used as a food preservative or enhancer. Sulfites are commonly blamed for causing headaches when drinking red wine, especially among women. Sulfites are generally not considered an allergen, but can cause common symptoms of a allergic reaction, such as: difficulty breathing, sneezing, swelling of throat, and/or hives. These are only some of the symptoms attributed to sulfite reactions and it may be that people experiencing these symptoms might not produce the enzymes necessary to break down sulfites. While sulfites may cause these particular symptoms in some people, they don’t cause headaches, says Frederick Freitag, Associate Director of the Diamond Headache Clinic. The more likely culprits for producing headaches may be the histamine, tyramine, tannins and of course alcohol produced during the fermentation process. Mike and I had the privilege of attending the first ever Lauren Ashton club members event last Saturday. The food was very complementary to the new releases and the atmosphere was lovely. Kit Singh outdid himself with the 2011 Cuvee Mirabelle, a wonderful blend of Grenache(55%), Syrah(40%), and Mourvedre(5%), producing a rich blend of dark fruits and a peppery balance. The Cuvee Meline is also a beautiful blend of Sauvignon Blanc(83%) and Semillon(17%), boasting of pineapple, peach, and grapefruit flavors that were fermented at low temperatures. For more information about this unique winery please refer back to my article titled “Out Of The Box“. Jean Claude Beck, wine maker for Woodhouse Wine Estates, passionately exclaims, “I do not make European blends, I do not make French wine-I make Washington State wines!” That he does! Beautiful, artistic wine with a gorgeous French familiarity. Jean Claude, who comes from a family that has been producing wine since 1579, believes that wine is wine and should be made in simple form. He achieves his goals by slow fermentation and low cooking temperatures to preserve the taste of the wine and provide the perfect balance. Jean Claude is very interactive with his growers and is highly involved with the choosing of his grapes. I just have to say a little something about this lovely picture I took of Alexandria Nicole’s Member’s Only blend. 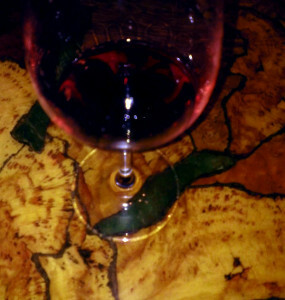 I wanted to share with you the beautiful maroon color of the wine contrasted against the natural wood of the tabletop. The picture really caught my attention and I noticed how you can appreciate a truly well made wine just through the simple beauty of it. Member’s Only is a French style blend of Grenache, Syrah, and Mourvedre that was aged in both two year and new French oak. 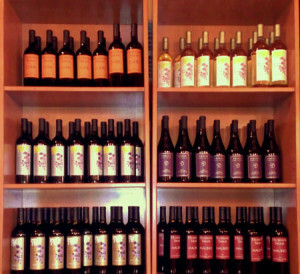 Please refer to my article “The Eclectic Wine” to learn more about Alexandria Nicole and their wine club. Mike and I visited the Carriage House Tasting Room; otherwise known as Delille Cellars in Woodinville Wine Country. The power was out but they were moving full steam ahead. There was hardly any room to stand and there is reason behind that. Chris Upchurch, wine maker for Delille Cellars, provides a wonderful example of how French style wines can be beautifully made in Washington. Chris has been with Delille Cellars for the past 23 years, as long as they have been in business. He has brought elegance and good balance to his product and by doing so Delille Cellars has had the honor of having their Chaleur Estate Blanc served in the White House over the last three administrations. To add to their list of praises, Delille Cellars has been the only winery in the world to be listed in both the Wine Enthusiast and Wine Spectator top 100 wines of the world for two consecutive years. You can find this information on their impressive web site which covers everything from staff to aging charts. They also provide a place where you can recycle your corks, so take advantage of that wine lovers! I highly recommend visiting the Carriage House to enjoy their European French style blends. They are fun, amazing, and tasty! Learn how Chris co-ferments his lovely Syrah, which is 100 percent Red Mountain AVA. Be ready to be served by knowledgeable, passionate staff,and have a lovely time! How much more romantic can it get than to drink wine by candle light with the one you love? My husband and I went to Woodinville on Saturday to pick up some wine club releases and do some tasting. 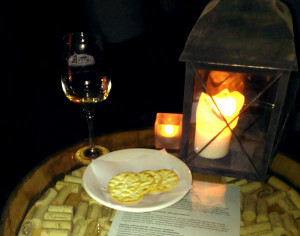 The power was out due to the wind storm that went through and the wineries that were open were doing their tastings by candle light. 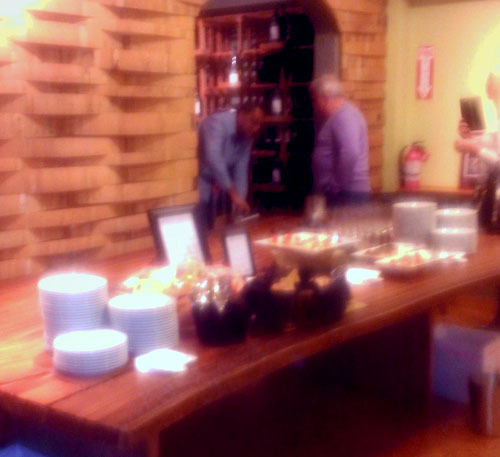 I’ll have some posts regarding new thoughts and discoveries from our tastings — this post is just to say that we had a blast, we loved the ambiance, and everyone was just going with the flow and were very accommodating. Thank you to all the wineries and staff that chose to brave the storm, operate under less than ideal circumstances, and provide a memorable and wonderful experience. I live in the beautiful little town of North Bend, Washington. What a wonderful place to live with friendly people, quaint shops, and nice restaurants and coffee shops. While working on my articles, I really enjoy going to Pioneer Coffee and visiting with all of my local friends. What I really love is that Deanna Haverfield, proprietor of Pioneer Coffee is a real supporter of Washington State wines and carries a nice wide selection. Deanna’s family also owns the Pioneer Coffee in Cle Elum. She was telling me that her mother, Julie, is very much into Washington wines and has a vast collection in her shop as well. I gotta go check it out! I could possibly be there all day long-LOL. Heather, who is a barista at Pioneer Coffee, has a broad knowledge of Washington State wine and can answer any questions that pertain to any varietal that is carried in the shop. The loungy, atmosphere is a really great and comfortable place to share a bottle with a friend or spouse. What is it that we think about when we think of our favorite wine? Let me refresh your memory-family, food, and fun! Does it always have to be so traditional, and stuffy? Why can’t we enjoy that type of experience in a fun, upscale environment that appeals to a range of ages and tastes? Is there a venue with a lively feel, some throwback exclusivity with “secret” club rooms, attentive staff and of course fabulous wine! When the wine is right! I was taking a look at my wine stock and was thinking about how some of the wine that I have hold a special meaning to me and then I started to wonder when would be the right time to drink the wine. Is there really any right time to drink wine? 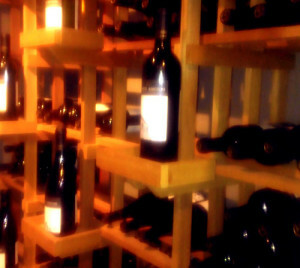 Wine is meant to be drank, enjoyed and savored, not stored and left on a shelf. The beauty of wine is that you can drink it at any time and it makes every moment special, no matter what the circumstance may be. Wine that has been given as a gift should be shared with the giver, so that the moment can be shared and appreciated by each other. My husband and I visited this quaint little winery in the industrial district of Woodinville. Facelli Winery has been owned and operated by the Facelli Family since 1988, sourcing grapes from the finest Washington vineyards. Lou Facelli, wine maker, has achieved a true Italian family feel with a very warm welcoming atmosphere in his winery. From the moment we stepped through the door we were showered with that customary Italian love. Wine is truly about being with family and creating an environment that invokes love and laughter.